I decided to try something that I never thought I could do, make bread. There was always something really ominous about baking bread without using a box kit or a bread machine. I was craving good bread to dip in olive oil, balsamic vinegar and Parmesan cheese so I decided instead of forking out the $5-$7 bucks for the fancy artisan bread at the store, to try to make it myself. I also wanted to have a chance to use the dough hook on my Kitchen Aid Stand mixer, after 8 years, I finally learned that is what it was used for! I pulled out my stand mixer and got started. 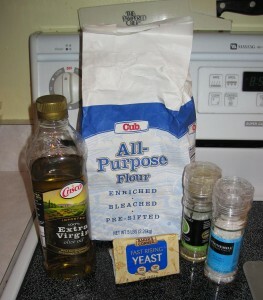 In the mixing bowl pour 1/3 cup warm water add 1 tablespoon sugar and packet of dry yeast, mix with spoon until moistened. Let stand for about 10 minutes until creamy and frothy. Turn on mixer on slow mixing with a bread hook if you have one. Remove the dough ball from mixer and knead lightly on a flat surface sprinkled with flour. Lightly oil the mixing bowl with about 1 tablespoon of olive oil. Return the dough ball to the oiled mixing bowl, roll the ball in the oil. 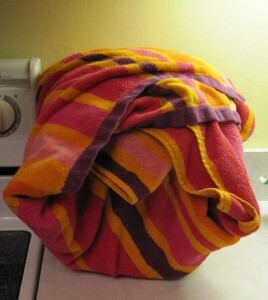 Cover the mixing bowl with a warm, slightly damp cloth and let rise in a warm area. 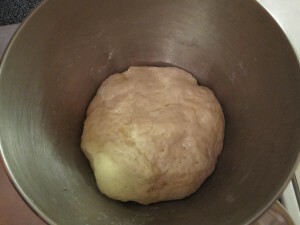 Allow the dough to double in size, about 30 minutes later. 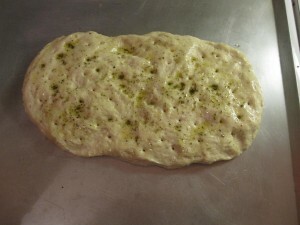 Shape the dough into a loaf on a flat slightly oiled cookie sheet. Poke about 30 small dimples into the dough with something like a chopstick. Mix the remaining 1 1/2 tablespoons of olive oil with the 1/2 teaspoon Italian spices and 1/2 teaspoon salt. 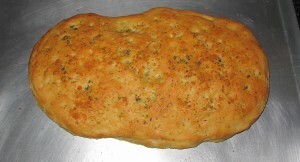 Use a basting brush and brush all of the oil, salt, and seasonings mixture onto the top and sides of the shaped dough. The seasonings will infuse the bread with the dimples. Sprinkle shredded or grated parmesan cheese on the top of the oiled, seasoned bread, this will make it look pretty! Place oiled and seasoned dough into the preheated oven and bake for 12-18 minutes depending on how dark and crusty you want your bread. If you want it lighter bake for 12. I like my bread crusty so I baked the top for about 15 minutes, I flipped the loaf and baked the underside for 3 minutes. Take it out of the oven, let it cool as long as you can stand to wait, and enjoy! You just made your own artisan bread for about a buck. 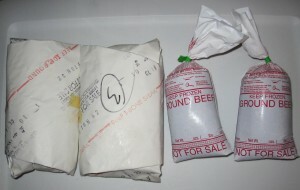 Use it for sandwiches, dinner bread, or dipped in olive oil, balsamic vinegar and Parmesan cheese with a glass of wine. Sounds like a perfect dinner to me! I was inspired to make homemade yogurt yesterday. There are no preservatives, I can control the sugar and fruit, It is incredibly inexpensive and I am not using additional energy to produce yogurt containers. My friend recommended a website that used a double boiler, sterilized equipment and a candy thermometer and I am not going to lie, I was intimidated! The last time I needed a candy thermometer I ended up with a caramel flavored rock stuck to the bottom of my non-stick pan. I went out searching for other recipes and found Crockpot365 A Year of Slow Cooking site and found her homemade yogurt made in a crockpot. I decided to give the crockpot method a try with a few alterations because quite honestly it looked easy! I pulled out my old school, 3 quart crockpot you know the one that has the 1970 brown pattern that I got as a hand me down, and went to the store. 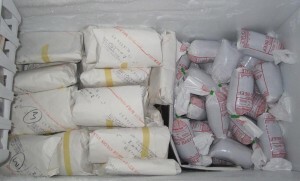 Frozen fruit of your choice, I used 1 bag of Organic strawberries, organic blueberries and one banana. I purchased 1/2 gallon of 2% organic milk. 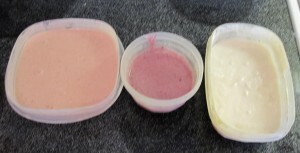 I purchased a container of plain yogurt with live, active cultures as a starter. Plain, not vanilla, not strawberry, not key lime pie, just plain. I poured the whole 1/2 gallon of organic milk in the crockpot and cooked it on low for 3 hours. In the crockpot you don’t have to worry about the milk scorching, I trust my crockpot to keep the temperature consistent without using a thermometer. After 3 hours I unplugged the crockpot and let it sit on the counter at room temperature with the cover on for an additional 3 hours. 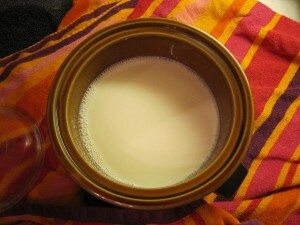 After 3 hours of sitting, I pulled out 1 cup of now warm milk and added 1/2 cup of plain yogurt with live active cultures. I stirred the milk and yogurt together and then stirred it into the rest of the milk in the crockpot using a wooden spoon. I wrapped the whole crockpot up in a large beach towel and kept it on the counter for 8 hours. Don’t disturb it, don’t stir it, don’t jiggle it, don’t open it even if it kills you, resist! This was the part where I was glad I went to bed because man did I want to peek! I set my alarm for 3 AM which was 8 hours later, because I did not want to let it over process, I read that if you let it sit for too long it will continue to get thick but it will also continue to get more bitter. Stir the yogurt to mix the water in with the yogurt and to make it smooth and then I put the whole crockpot into the fridge. I was tired, it was 3 AM! Surprise, surprise, I woke up to yogurt, it looks like yogurt, it smells like yogurt, it tastes like yogurt, heck it is yogurt! 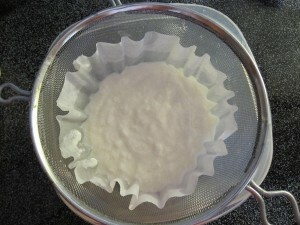 I pulled out 1 cup yogurt for the next batch to use as a home made starter. I then separated the remaining yogurt into 3 bowls. It was slightly watery so I drained some of the water out with coffee filters to thicken it up. I drained about 1/2 cup of water out of each of the three containers. The first one I put the yogurt into the blender and added a banana and blueberries and about 2 tablespoons of honey to it. I blended it up and it came out soupy. I poured it into a container and put it in the fridge and it set back up a little, but it was still more watery than normal yogurt consistency. I say this was my test batch, tastes great, but I wanted it thicker. The second one I wanted to try vanilla and honey yogurt. I put 1 teaspoon of pure vanilla extract and 2 tablespoons of honey into the filtered yogurt and stirred it up. It did not change consistency and it was awesome, not soupy at all. The third one I used a bag of frozen organic strawberries, let them thaw out for about 30 minutes and put them into the blender. 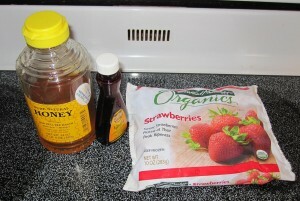 I added about 1/4 cup of the pureed strawberries into the filtered yogurt stirred it up but it was not sweet enough. I then added 2 tablespoons of honey to the strawberry and 1 teaspoon of pure vanilla extract and stirred it up with a spoon and again awesome, typical yogurt consistency! I have eaten a lot of yogurt today, my kids like the vanilla yogurt. I plan to add this to my morning smoothies and I am excited to make my next batch to see what other ways I can use different fruit varieties, next time I might even save some extra plain yogurt to use instead of sour cream. Give it a shot! I love granola! Granola bars, granola cereal, granola people, I like them all! 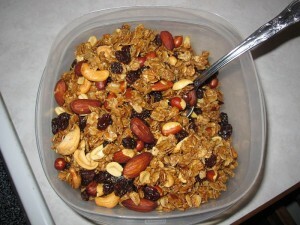 Today I decided to make my own granola instead of buying a box at the grocery store. Making it was so easy and awesome, I had to share! Mix the salt and cinnamin into the oats stir until mixed. Whisk together the wet ingredients in another bowl until totally combined, add to the oat and spices mixture. Stir it until all of the oats are covered and no more liquid remains. Bake the oats in a 325 degree oven for 15 minutes, stir and flip with a spatula one time in the middle of the 15 minutes. Sprinkle the mixed nuts on top of the oats and put in the oven for 5 more minutes. Sprinkle the raisins or dried fruit on top of the oats and nuts. That is all there is to it! Eat and repeat! Now I know what I am bringing along on my canoeing trip! I was watching a show one day about unhealthy trans fats in peanut butter. The partially hydrogenated oils that make the peanut butter never separate is unhealthy because it contains trans fats in small amounts. Trans fats are unhealthy because they raise your bad cholesterol, and lower your healthy cholesterol leading to potential artery blockages. Based on the serving size of peanut butter the trans fats might be labeled zero because it is less than .5 g of fat but there is always trace amounts. Trace amounts over a lifetime is not what I want to put in my kids bodies. My kids love pb&j sandwiches and I have caught my daughter eating peanut butter with a spoon from the jar she loves it so much. I decided I should try to get healthier peanut butter for my family. I tried a few brands without partially hydrogenated oils and I was not overly impressed. They were boring, I decided to try making my own. I found a few recipes I thought sounded good and took parts from each to make this version. 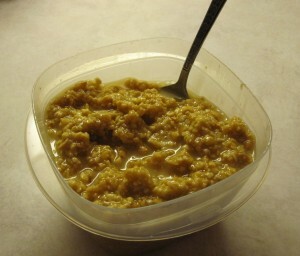 This is a chunky peanut butter recipe with a shelf life of 4 weeks because there are no preservatives. It is so good, I have a hard time wanting to waste it on toast, it is a treat in itself. My kids love this chunky peanut butter. 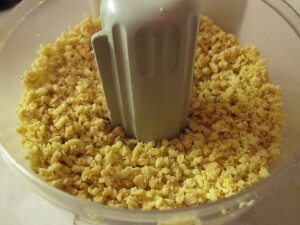 In a food processor chop the peanuts to a chunky, chopped peanut size, not too small to make them grainy and not too big that you can’t spread them. 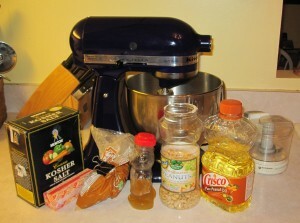 Put the chopped peanuts in a stand mixer. If you use salted peanuts, half the kosher salt. Put the honey, brown sugar and salt in the stand mixer. Using the food processor again, combine the salted butter and oil, process the two together for about 15 seconds until they are completely blended and creamy looking. Using a rubber spatula scoop the creamy oil mixture into the stand mixer. Mix the ingredients on low in the stand mixture until they are well blended and creamy, use the spatula to scrape the sides in the middle. Place the blended peanut butter into a sealed container. It will separate, stir it up before you spread it.